We begin with a woman named Lauren Kyte packing up her boss’ office, attempting to stifle her tears. Her boss has allegedly killed himself. She takes a few items from his office and heads home. While depositing her paycheck at an ATM, she is attacked by two men. 2 hours later, those same two men are found dead in an alley. Queue our favorite theme music! I need to apologize before I go any further: this scene obliterated my outer adult layer — my inner fangirl took over. 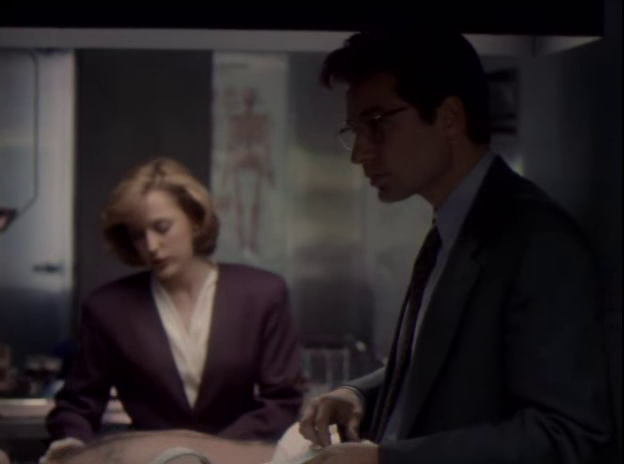 Mulder and Scully are summoned to Bethesda Naval hospital to look over two bodies. They meet two cagey agents from an unknown organization who have zero concept of give and receive. Though they’ve been called in to help, the other agents and the medical examiner offer next to nothing in the way of answers to Mulder’s questions. He’s only met with silent intense stares. 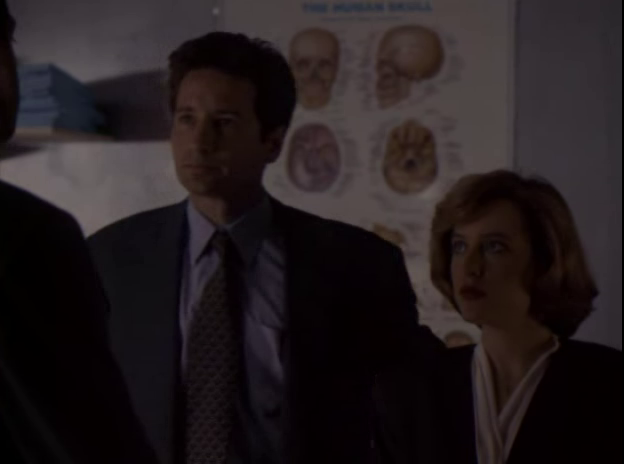 Scully answers what she can from observing the bodies. 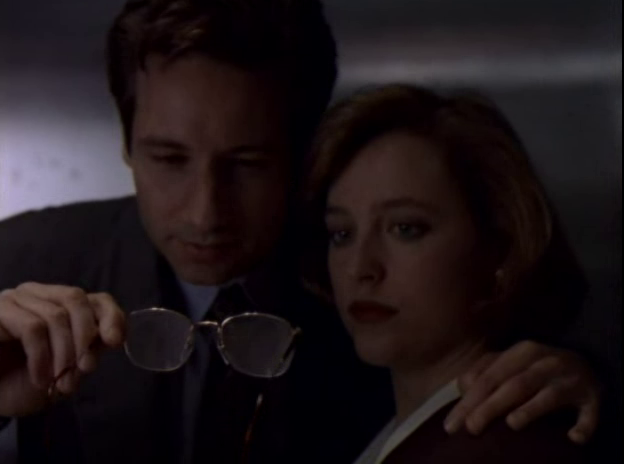 This will be my death: Lock of hair AND glasses, Mulder in profile. Seven Hells. The most interesting aspect of these two bodies: both throats have been crushed without evidence of tissue damage. 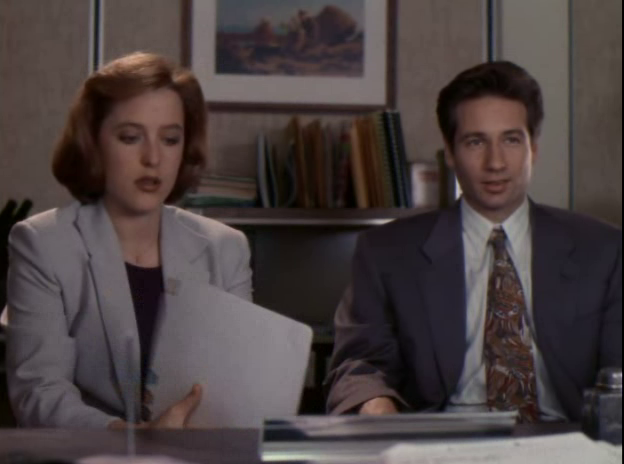 More questions from Mulder and Scully, more blank stares from the other agents. 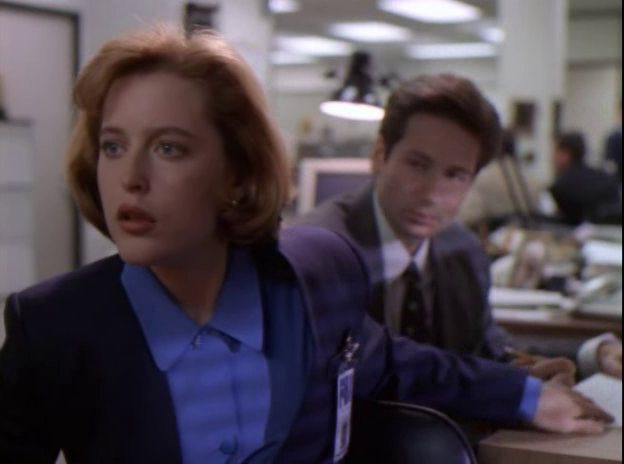 Scully’s annoyance level quickly matches Mulder’s. She asks why they’re being consulted. The other two agents ask if Mulder and Scully have ever seen any phenomena like this in the X-Files. Mulder says ‘no.’ And just like that, the meeting is over. I’ll say it again, these two love themselves some hallways. 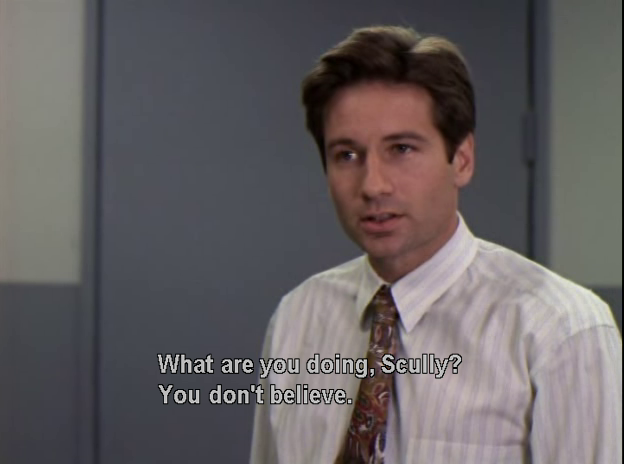 Scully knows Mulder lied about seeing that phenomena before. “I would never lie. I willfully participated in a campaign for misinformation.” Love him. Mulder says there are many separate X-Files with similar phenomena, but never ALL the elements in one case. 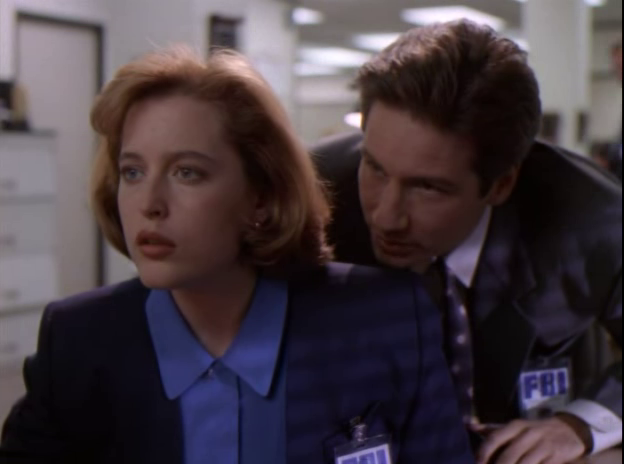 Scully inquires as to how an esophagus can be crushed without the neck being touched. Mulder excitedly whispers “psychokinetic manipulation.” Of course. She admits to being intrigued, but wonders how they can investigate with no evidence.Gird your loins, Shippers. This is totally unnecessary and yet all the more wonderful because of it. Hallways and Elevators. Sigh. Meanwhile, Lauren Kyte gives her two weeks notice to her late boss’ business partner, Mr. Dorlund. He’s creepy and shady and she needs to get the hell out of that office. She’s aided by an unseen force — who decides the best way to keep him from harming Lauren is to tighten his gaudy man-bracelet. If you’re a ghost who can manipulate objects and people — just PUSH him! Mulder and Scully do some digging on the dead men — they’ve got ties to an extremist group out of Philadelphia, 60 air minutes from where the bodies were found. 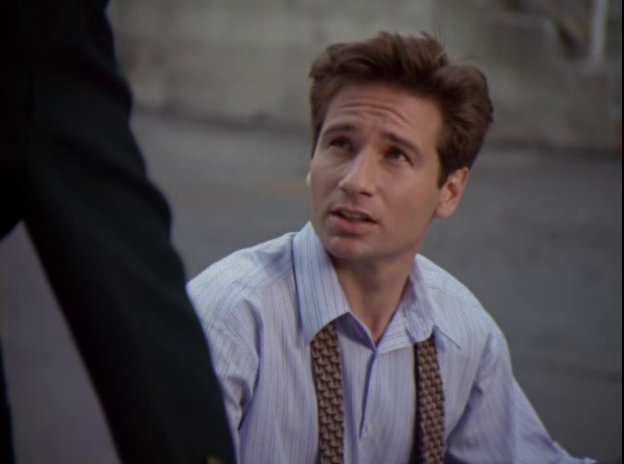 Mulder spots an ATM near the area where the Philly patrol officer found the men, and he and Scully find the video of Lauren Kyte being attacked. This shot is gold. Lauren Kyte denies having seen the two men who attacked her, but neither of our agents believe her. 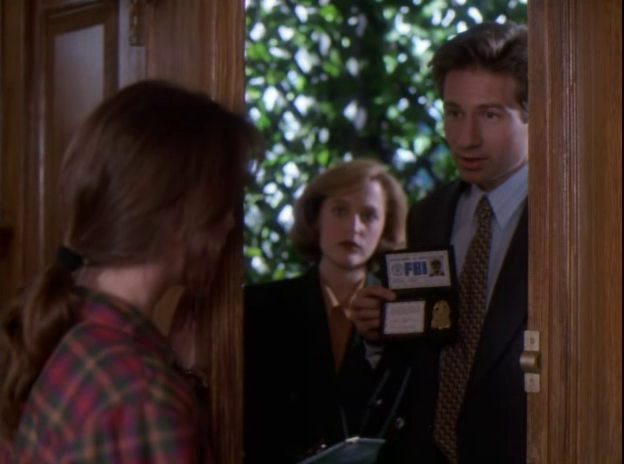 They don’t get much out of her, but she does get Fox Mulder’s cell phone number in case of an emergency, so there’s that. I for one, am grateful that our agents have learned to immediately put on their seat belts in the car. **Remember the Pilot Episode** They lose control and zoom backward down the street before crashing into another vehicle. 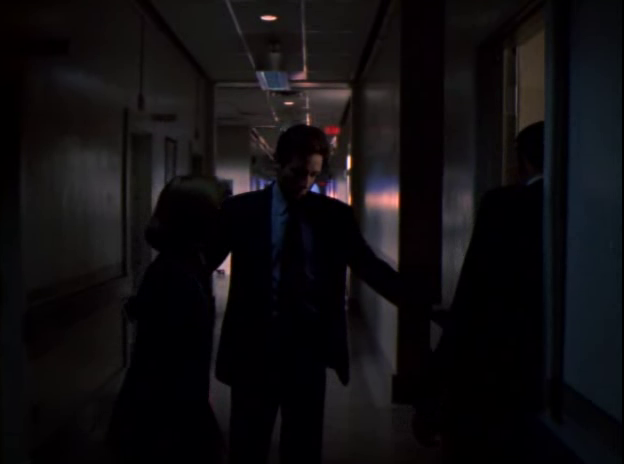 I think many of us miss this if we’re watching in standard format, but for some reason I caught it — here’s a reassuring hand hold after Mulder asks Scully if she’s okay. There may be some squeezing in there. First time I’m seeing this. So sweet. While their car is checked out by a mechanic, the powers that be try to kill me with Mulder. They’ve nearly succeeded by this point. He’s suggesting that Lauren Kyte is unknowingly emitting high levels of electrostatic charge from her psychokinetic power. Or, a poltergeist is responsible for their crash. 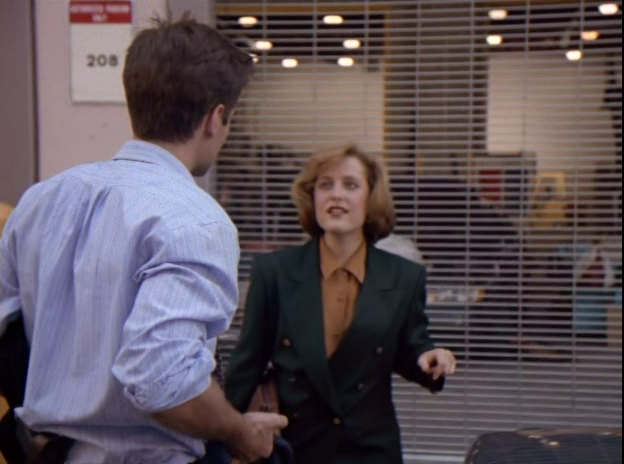 Scully jokes with him with that famous line from Poltergeist and it’s too cute. 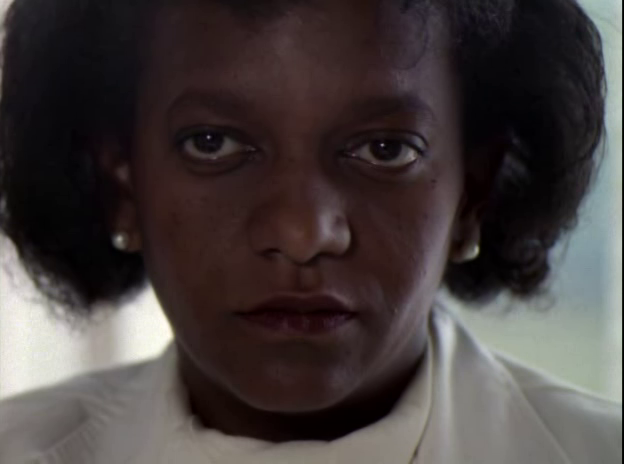 She also is not having any of this psychokinesis argument. She theorizes that it’s far more likely that Lauren was targeted because of her companies’ possible connection to the extremist terrorist group and that she has an accomplice. They’ll have to watch Lauren to find out more. I. Just. Can’t. Anymore. Where’s my ice cream…? There’s a big part of me that will always appreciate the 90’s screen-gazing fad. Especially when it involves our two lovelies. Back at her apartment, Lauren witnesses some weirdness in her bathroom and manages to learn (in spite of much sniffling and shaking) that her boss was murdered. Despite the evidence, Mulder and Scully want to double check that Howard Graves is in fact deceased. 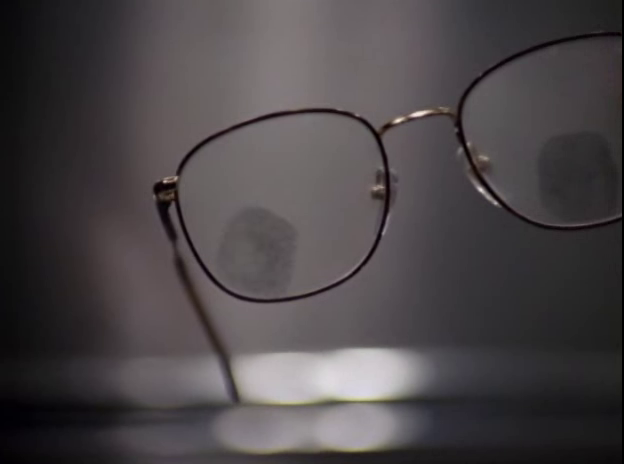 They turn to the medical examiner for his case, Ellen Bledsoe, ME, who is my favorite guest character in this episode. Her delivery of “Howard Graves is very dead” still makes me laugh to this day. It’s also memorable for me because I remember watching this episode with my dad — who promptly cracked up when she said this. To give you some context, my dad is h stereotypical former US Marine; quiet and scary to those who don’t know him. While he has a sense of humor, it’s got to be genuinely funny to crack him. Ellen Bledsoe had my father positively giggling with her exchange with Mulder and Scully. For this alone, she’ll always hold a special place in my fangirl heart. Lauren Kyte calls Mulder and asks that they meet her at her house in a hurry. Mulder arrives in time to see an invisible force Sith-choke a would-be assassin. 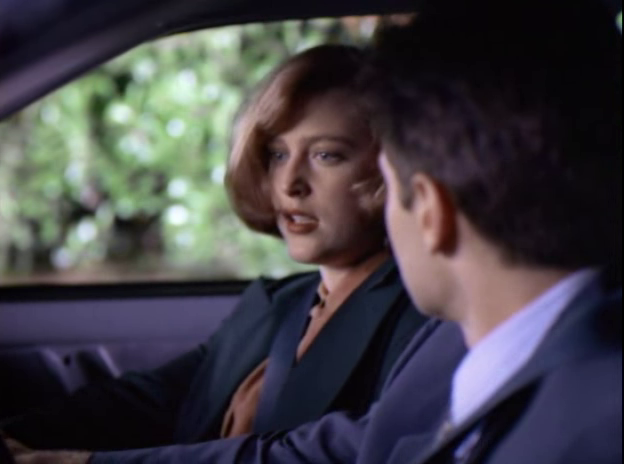 Scully, laughably at this point, just misses it. Back at the police station, Lauren slides into an all-too-lengthy monologue about her relationship with her boss and why she thinks he was killed. By this point, I’m annoyed with her character. 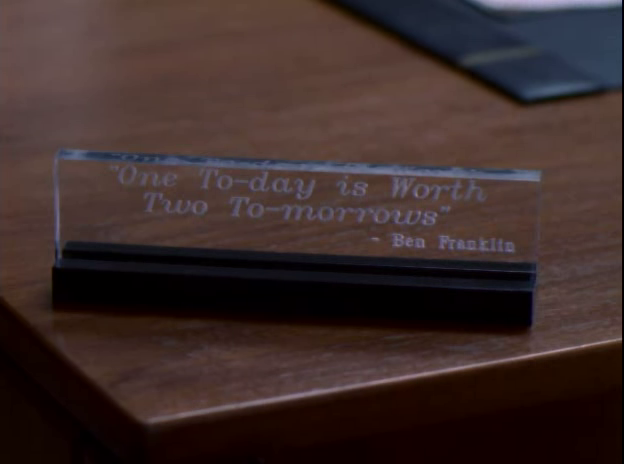 This is the part of the episode that always feels tired to me. We’ve been told the same thing twice now. We get it already — terrorist group was in deep with Graves’ business partner. Move on please. Surprisingly, and to her partner’s dismay, Scully rises to tell her that Lauren can help Howard by helping the FBI finish his unfinished business. 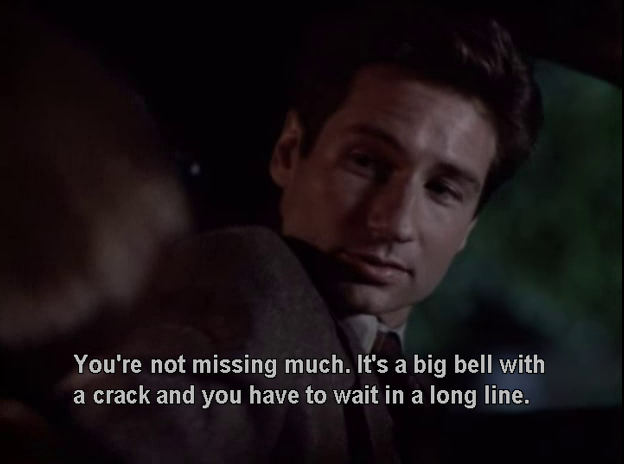 I’m not sure I agree with Mulder here. It’s true, Scully doesn’t believe, but she believes that Lauren believes. Mulder is upset because in doing so, they’ve probably lost their best chance at witnessing true spectral phenomena. 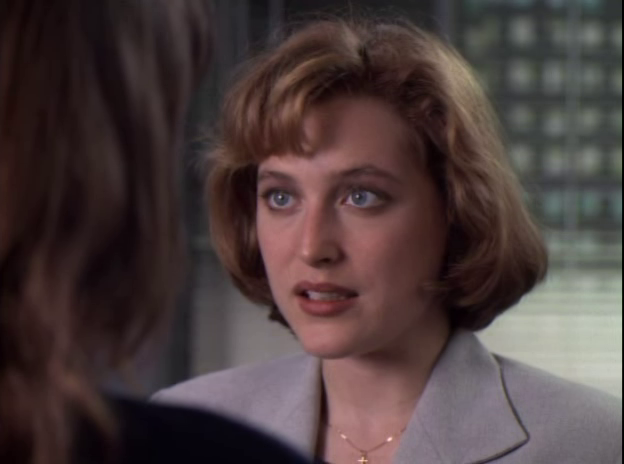 Scully reminds him that their priority is solving the case and punishing those who are actually guilty of a crime. 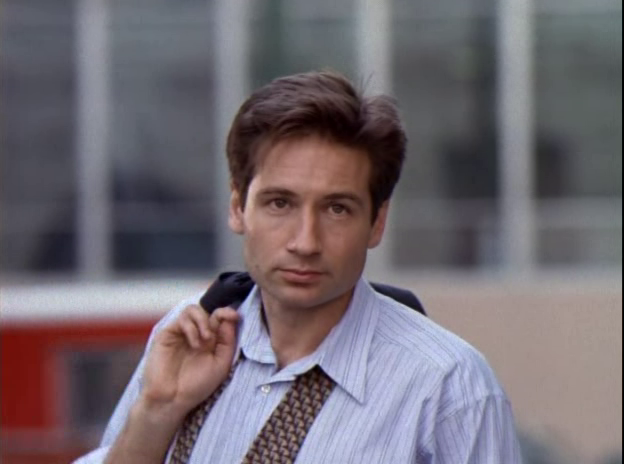 I’m sorry, Fox Mulder, you’ve got my heart, but I’m with your partner on this one. 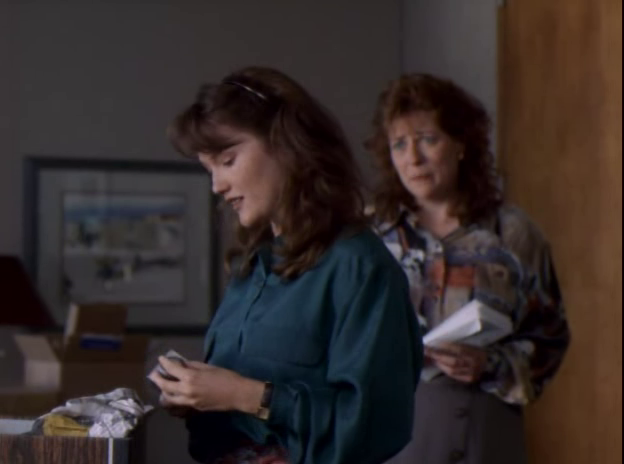 A joint task force works with Lauren to search Dorlund’s office. 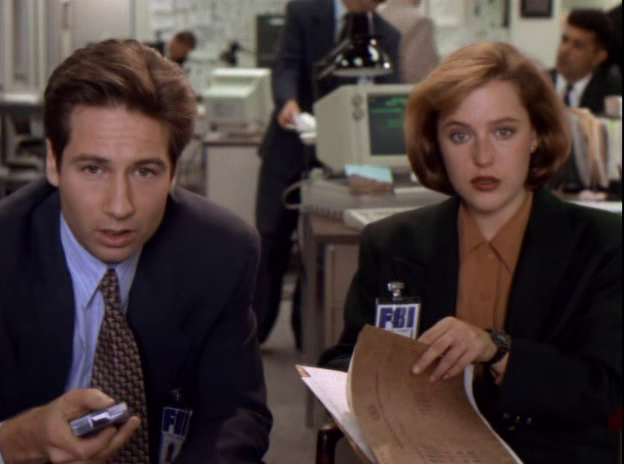 They don’t find anything until the ghost of Howard Graves traps Mulder, Lauren, and Dorlund in his office and swirls an absurd amount of paper in the air before revealing a floppy disc hidden in the wall. After sending Lauren on her way, Mulder asks Scully if she believes in an afterlife. 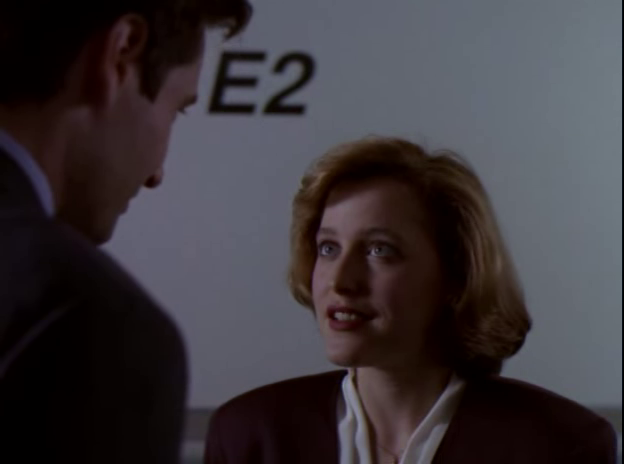 Her cool reply of “I’d settle for a life in this one” leads Mulder to ask if she wants to go see the Liberty Bell with him. Again, not a favorite episode of mine, but there were some memorable moments. See you all soon! Thanks for sharing in my madness.